I have taken delivery of some lovely new toys from Maileg, including new bunny furniture (wardrobe, bench, changing table, pram) and some new fabric bunnies, giraffes and knitted toys too. 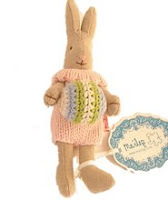 It's hard to choose but I think my favourite is this little 'newborn' bunny rattle. She is holding a little knitted jingle ball that makes a really sweet noise when you give her a shake. There are blue and lemon 'newborns' too.